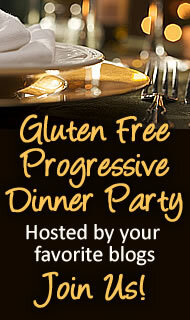 Next week is the Gluten Free Progressive Oscar Dinner Party. Yes, all of us are creating a meal related to an Oscar-nominated movie—another brilliant idea from our fearless GFPDP leader, Diane (The W.H.O.L.E. Gang). Won’t it be fun to see what everyone makes? Not only are you guaranteed a variety of wonderful recipes in our monthly GFDP, but there are always recipes to fit everyone’s dietary needs. I’ll be serving my meal on Monday, so please be sure to check in after the weekend. Today is the Friday Foodie Fix over at Diane’s. The “secret” ingredient is agave nectar. Head over to my Out and About page to see what I’ve created. I promise that you won’t be disappointed! Oscar Party. Actually a better idea for a dinner party than many others. I wonder if anyone will pick Inglorious Basterds and especially what will be prepared in that theme…..German, Austrian or French? Wow, I feel this will give me knowledge of a bunch of new recipes, PLUS educate me about, uh, Oscar nominated movies…he, he, I’m kinda out of the loop on that topic.